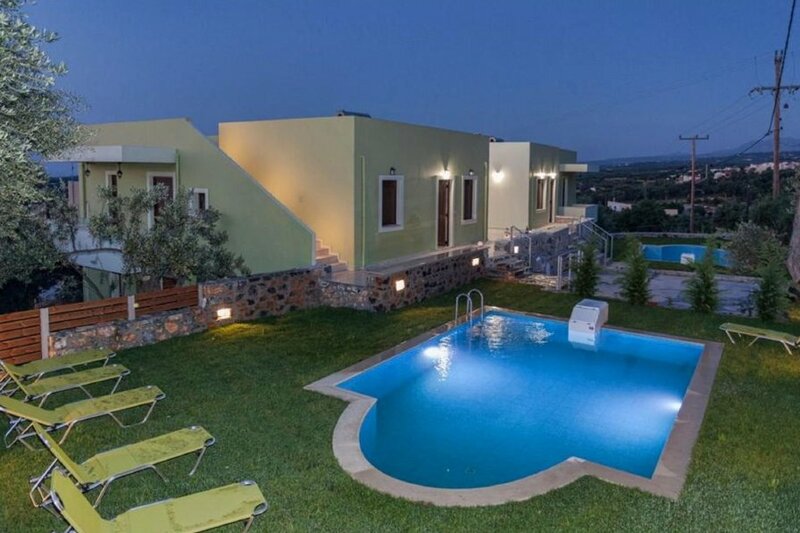 This 2-bedroom villa for up to 4 guests is located in Rethymnon and has a private swimming pool. Simple, comfortable house Mela Villas. 2 houses in the residence. In the district of Maroulas, in a quiet position, 4 km from the beach, in the countryside. Private: small garden with trees, lawn for sunbathing, swimming pool (19.03.-23.12.). Room cleaning on request (extra). Parking at the house. Grocery 1 km, supermarket 1 km, restaurant 750 m. Nearby attractions: Venetian Harbor 8 km, The Monastery of Arkadi 9 km, Old Town of Rethymnon 8 km. Well-known lakes can easily be reached: Lake Kournas 33 km. Please note: car recommended. The photograph shows a typical example. Villa Orange, 3-room villa 75 m2. Spacious and bright, practical and tasteful furnishings: open living/dining room with satellite TV (flat screen). Exit to the terrace, to the swimming pool. 1 room with 2 beds. Exit to the balcony. 1 room with 1 double bed. Exit to the balcony. Open kitchen (oven, 4 ceramic glass hob hotplates, electric coffee machine). Shower/WC. Air-conditioning. 2 small balconies, small terrace. Barbecue, deck chairs, sitting area. Beautiful panoramic view of the countryside. Facilities: washing machine, iron, hair dryer. Internet (WiFi, free).